If Ofcom ignores the Secretary of State and the evidence it has been sent, then the diversity debate may need to shift from the political arena to the courts. 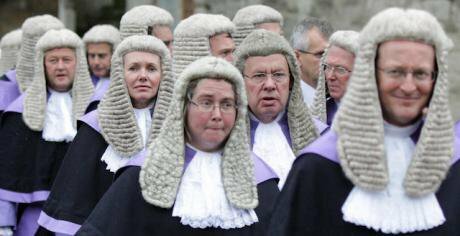 Members of the legal profession make their way from Westminster Abbey to the Palaces of Westminster for the Judges' Procession. Lewis Whyte/Press Association. All rights reserved. Part 1 ended with Ofcom proposing a “Wait and see” approach to the regulation of off-screen diversity employment for the BBC and its suppliers; politicians including Digital Minister, Matt Hancock, Lady Bonham Carter (LibDem Shadow Minister), Helen Grant MP (Conservative), and David Lammy MP (Labour) united in the view that Ofcom should introduce rules and regulations to address off-screen diversity; and Ofcom demonstrating a less fastidious approach to information and a febrile atmosphere. We have seen some of what Ofcom said at its diversity stakeholders meeting. What Ofcom didn’t tell the meeting, and no one had spotted, was that Ofcom had specifically excluded Article 14 Diversity from its Consultation on the Draft BBC Operating Framework. Ofcom had hidden this exclusion away in footnote 66 to paragraph 4.123 in the consultation document. (1) The BBC must ensure it reflects the diverse communities of the whole of the United Kingdom in the content of its output, the means by which its output and services are delivered (including where its activities are carried out and by whom) and in the organisation and management of the BBC. (4) In complying with this article, the BBC must have particular regard to the need to reflect underrepresented communities. Article 14 means that BAME people must no longer be under-represented in the suppliers of content and services or in the organisation and management of the BBC. The word on the street had Ofcom saying Article 14 was just a matter for the BBC. Advice was needed. The Campaign for Broadcasting Equality (CBE) turned to Goodman Derrick. Goodman Derrick had been the Granada Television lawyers when it produced the legendary investigative series World In Action. Goodman Derrick’s robust and reliable advice had enabled Granada to stand firm behind the many investigations exposing corruption by guilty men and well resourced companies. One of its partners is Stephen Hornsby, an expert on regulatory matters. Hornsby has written about Ofcom, taken it on and won. “Article 45 of the Charter provides that in carrying out its functions under the Framework Agreement, Ofcom must have regard to the BBC’s duties under Article 14. Section 5.4 of the Agreement with the BBC goes further and requires the Operating Framework to set out how compliance with General Duties (such as Article 14) can be enforced. The legal advice said Ofcom was wrong. It also pointed to legal action that could be taken if the BBC were to breach the employment diversity part of Article 14. CBE has been no fan of Karen Bradley. It was an active and aggressive critic when Bradley blocked the appointment of Althea Efunshile to the board of C4. Now Karen Bradley has become an unlikely hero of the revolution. Ofcom published the Secretary of State’s letter together with replies from Ofcom’s CEO, Sharon White, and its Chair, Dame Patricia Hodgson. In a distinguished career, Dame Patricia has served as Principal of a Cambridge college, CEO of the Independent Television Commission, on the BBC Trust, and earlier, as the BBC’s Director of Policy, was the BBC’s gladiator in the Charter and Licence negotiations on1995 and 2000. Her reply to the Secretary of State was rather frosty, saying the Charter was now “sealed”. The correspondence between Bradley and Hodgson came under the spotlight when the Guardian published “Labour accuses culture secretary over BBC and Ofcom 'interference'”. It seemed to me the world was going topsy-turvy. In 1989-90, I was Director of the Campaign for Quality Television, seeking to persuade a Conservative government to include just such safeguards in the 1990 Broadcasting Act. Now, a week after the Lenny Henry meeting where politicians of all parties had wanted Karen Bradley to write to Ofcom about off-screen diversity, Bradley had done so, and now she was being attacked by the Labour Culture spokesman for doing so. Was Dame Patricia right to be so frosty, was Watson on strong ground attacking Bradley, was Karen Bradley’s letter to Ofcom inappropriate because it infringed Ofcom’s independence? Stephen Hornsby explained that provisions in the Communications Act 2003 Section 9 meant Ofcom is subject to statutory oversight “designed to prevent “regulatory capture” of the sectoral regulator; any suggestion that it has carte blanche as BBC regulator would be misconceived.” Was Dame Patricia right to be so frosty, was Watson on strong ground attacking Bradley, was Karen Bradley’s letter to Ofcom inappropriate because it infringed Ofcom’s independence? The legal advice concluded: “the impression given in the Hodgson letter of total Ofcom autonomy is contradicted on the specific issue of diversity. In the Appendix to the Agreement in Schedule 3, paragraph 12, sub-section 3, the Secretary of State may make a “direction” to the BBC to amend paragraphs dealing with equality of opportunity and require the BBC to make further arrangements for the guaranteeing of diversity. The power to issue a “direction” could arise if there is some defect in how the regulatory arrangements are working. In responding to the consultation on the draft operating framework as she did in her letter of July 25, the Secretary of State was simply flagging the existence of this particular General Duty under the Charter which Ofcom has a duty to enforce amongst many others in Sections 9-18 of the Charter. The Charter is an agreement in many respects and so is the Agreement; the BBC can be sued in the normal way as it owes duties to those affected by the exercise of these. As economists know, only the future is difficult to predict. If Ofcom ignores the Secretary of State and the evidence it has been sent from a range of organisations about the need for regulatory requirements and performance measures for BBC off-screen diversity of employment, then the diversity debate may need to shift from the political arena to the courts. If a judicial review were to be necessary it could cost £100,000. A lot of money, but with generous philanthropists committed to diversity, it might not be an impossible sum to raise. By chance, I met the Digital Minister, Matt Hancock, at a Natural History Museum event after he’d had his meeting with Sharon White. He said Sharon White had told him she had an open mind on diversity. Ofcom announcements are expected this month. Fingers crossed.